My father abandoned us after my mother divorced him. My stepfather passed from cancer. I was in an abusive relationship. As well as dealt with alcoholism and other obstacles in my life. My scars; whether their physical, or the ones I allow to be seen through my words or by my voice, will never be used as a tool to try and further damage me. They will be used to show that I am a fighter. That I am strong and that I survived and will always survive. I am a warrior; do not be ashamed by my battle wounds. Embrace them, just as I embrace them. Embrace your own battle wounds! You’re a survivor; you have a story that needs to be told to ears that need and want to hear. We as the survivors of our circumstances need to be the voice for those who no longer have one, and to those who have yet to find their own voice. 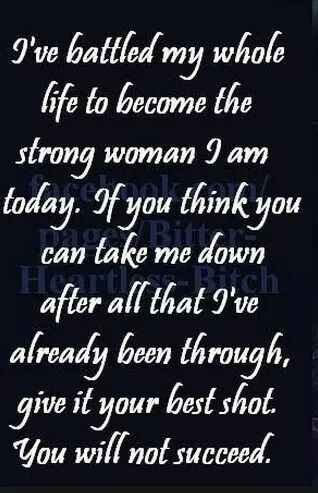 This entry was posted in Addiction, Blog, Domestic Violence, Encouraging, hope, Inspirational, survivors, Writing and tagged strong, survivor, warrior. Bookmark the permalink. Thank you very much! You’re awesome! Battle-on! The quotation at the beginning of your post above characterizes my own position, and especially when my son’s father threatened that he and his family would “ruin you [me]” for choosing life for our son. I had no idea how real the threat really was, however. My son was, for the last time, permanently abducted under the color of law and sold to his father and their family on May 08, 2012 (no meaningful contact since though I raised him alone). Julian’s Justice Journal, Family Court Femmes Fighting Corruption, and (Dedicated to) The Real Mommies and Daddies of the Real America, and Our Children Who Want to Come Home were inspired by my son. Good luck, and many blessings to you!